Darwin's famous first tree of life sketch, annotated by Mark Blaxter. Mark Blaxter (Institute of Evolutionary Biology, University of Edinburgh) reports on the “Caenorhabditis Genomes Project” workshop at GSA’s recent 20th International C. elegans Meeting. Caenorhabditis elegans, affectionately referred to as “the worm,” is one of the prettiest and most informative of the model organisms. It is see-through, has a simple lifecycle and a remarkably simple anatomy, and it has been the foundation for many major discoveries. Indeed the worm —in collaboration with outstanding human scientists— has won several Nobel prizes. However, C. elegans is also just one of perhaps a million species of nematodes found in every habitat on earth. It provides only a single anecdotal example of how to be a nematode, how a cooperating group of genes can produce a successful organism, and how altering those genes can disrupt this success. 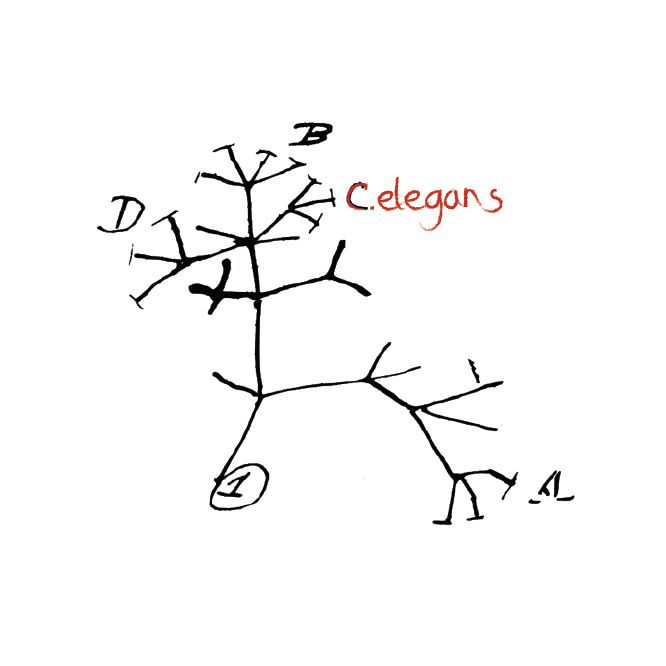 As Theodosius Dobzhansky said, “Nothing in biology makes sense except in the light of evolution” , and it is clear that C. elegans will only be fully understood when it is placed in an evolutionary context. At GSA’s recent 20th International C. elegans Meeting in Los Angeles, a breakout workshop met to discuss progress in developing and exploiting the richness of (and excitement about) those species most closely related to C. elegans. The last few years have seen a flowering of our understanding of Caenorhabditis diversity. C. elegans has long been described as a “soil nematode”, but it is in fact very rarely found in soils. Instead, C. elegans and other Caenorhabditis species are naturally found in nutrient- (and bacteria-) rich habitats, such as rotting fruits, decaying plant stems, and human-built habitats such as compost heaps. By searching through rotting plant matter in wild ecosystems across the globe, focused discovery efforts have yielded over 40 new species beyond the dozen already known and in culture. At the workshop, Karin Kiontke (New York University) presented a sobering graph of Caenorhabditis species discovery through time. The growth was exponential, with a lift-off in the late 2000s when Marie-Anne Félix and her colleagues first discovered a Caenorhabditis Eden in the ancient apple orchards—or rather the rotting apples—of Northern France [2,3]. The new species being identified reveal that the hermaphroditic lifestyle of C. elegans is unusual. In fact, only two other species are known to be hermaphroditic, while the rest are male-female species. Excitingly, the known taxa now range from closely-related sister species that can still mate with each other (but produce infertile offspring) to species that diverged tens of millions of years ago. A candidate for the long-sought-for sister species to C. elegans was announced at the meeting by Gavin Woodruff (Forestry and Forest Products Research Institute, Ibaraki, Japan) and colleagues – currently just called “Caenorhabditis sp. 34” but already under intense genetic, genomic and morphological study. Sequencing the C. elegans genome  remains one of the milestones of modern biology. I remember, as a new postdoc in the 1990s, eagerly awaiting the latest news of newly sequenced C. elegans cosmid sequences from the Cambridge and St. Louis teams, scouring through the lists of genes in the samizdat pages of the Worm Breeders’ Gazette. Indeed, in the middle of one of the very first cosmids sequenced was “my” gene, a nematode globin! That excitement, and realization of the power of genomics, has never left me. Since then, several other Caenorhabditis genomes have been published (C. briggsae, C. angaria,) [5,6] and a number sequenced and released (C. remanei, C. nigoni, C. brenneri, C. tropicalis) . At the workshop, Matt Rockman (New York University) addressed the question “What would a fully-sequenced phylogeny of Caenorhabditis do for us?”, with the “us” including all of the Caenorhabditis community and a growing community of biomedical and genetic researchers embracing the power of the worm. He presented a startling vista of potential contributions to genetics and bioscience—from speciation to the long-term dynamics of genome evolution, testing of population genetic theory, exploration of morphological specializations, uncovering the genetic bases of homoplasy, revealing conserved functional elements, and understanding the resilience and conservatism of genetic networks. In terms of technology and scientific desire, the time is ripe to sequence as many Caenorhabditis genomes as possible. After discussions at the “Evolution of Caenorhabditis” meeting in Cambridge, UK, last year, we in Edinburgh announced a project to sequence as many of the remaining Caenorhabditis species genomes as possible (see http://caenorhabditis.bio.ed.ac.uk/), with initial support from Edinburgh Genomics (http://genomics.ed.ac.uk/). At the workshop, Georgios Koutsovoulos (University of Edinburgh) presented current progress toward this goal: 16 new genome datasets, 16 initial assemblies of varying completeness, and a wealth of new data. To a surprising extent, the species varied in the difficulty of sequence assembly. This likely relates to levels of retained heterozygosity in the outbreeding species sampled. Georgios introduced the small team of Master’s students in Edinburgh working to generate assemblies for their chosen species, and invited others in the community to become “species champions”, shepherding their chosen Caenorhabditis through to formal release of their sequence assembly. With only short-read data used thus far, it is unlikely that the new genome assemblies will approach the quality of the completed C. elegans genome. Erich Schwarz (Cornell University) presented his exploration of how long-read technologies could help in achieving higher quality assemblies. Using PacBio SMRT reads, he was able to significantly improve assembly with only a small quantity of data. This was very exciting news, and while these long-read data remain relatively expensive, Erich’s lead paves the way for the Edinburgh genome drafts to be improved by the community. So where to next? The workshop closed with a discussion of how to make the new genomes good enough for everyone’s needs, and how to coordinate efforts globally. A pressing need—as always—is funding. Karin introduced several new species to the workshop, and her discovery graph suggests there will be a sequencing queue for some time yet. We left the workshop with long lists of things-to-be-done—reassemble genomes, improve assemblies, deliver data, find funding—and a strong feeling we had been part of a leap forward. And at the next International C. elegans Meeting in two years’ time, we hope to organize a workshop on the real biological insights derived from the blooming of the Caenorhabditis Genomes Project. Kiontke, K. C., et al. (2011). A phylogeny and molecular barcodes for Caenorhabditis, with numerous new species from rotting fruits. BMC Evolutionary Biology, 11, 339. doi: 10.1186/1471-2148-11-339. The C. elegans Genome Sequencing Consortium (1998) Genome sequence of the nematode C. elegans: a platform for investigating biology. Science 282: 2012-2018. Stein, L. D., et al. (2003). The Genome Sequence of Caenorhabditis briggsae: A Platform for Comparative Genomics. PLoS Biology, 1, E45. Mortazavi, A., et al. (2010). Scaffolding a Caenorhabditis nematode genome with RNA-seq. Genome Research. doi: 10.1101/gr.111021.110.